Zenaida Yanowsky as Odette in a 2007 Royal Ballet production of Swan Lake. 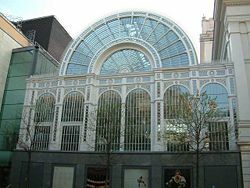 The Royal Ballet is Great Britain's most prestigious ballet company, based at the Royal Opera House, in Covent Garden, London. 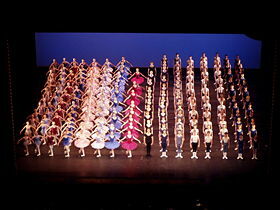 Led by Director Monica Mason, its 83-strong troupe conducts regular international tours. The Royal Ballet was founded as the Vic-Wells Ballet by Dame Ninette de Valois in 1931 and performed at the Old Vic and Sadler's Wells Theatres until 1946. The name soon changed to the Sadler's Wells Ballet. At that time, de Valois was invited to bring the company to the Royal Opera House as the permanent ballet company of the newly-founded opera and ballet troupe under the direction of David Webster. In 1956, the company was granted a Royal Charter. The British royal family has been personally involved in its direction ever since. The Royal Ballet has featured some of the world's premier dancers and choreographers and has also served to cultivate new young talent through its associated school. The Royal Ballet was the personal vision of Dame Ninette de Valois who served as dancer, choreographer and entrepreneur in the company's early days. She assembled a small company and school, the Vic-Wells Ballet, and, in 1931, persuaded Lilian Baylis to provide it with a home at the Sadler's Wells Theatre in North London. The company also performed at the Old Vic Theatre, hence its original name. The company remained at Sadler's Wells Theatre until 1939, and the outbreak of World War II. De Valois produced much of the early choreography including The Rake's Progress (1935) and Checkmate (1937), as well as acquiring Russian productions from the Diaghilev and Mariinsky Theatres when finances permitted. Alicia Markova and Anton Dolin were the company's original leading dancers appearing in Giselle in 1934. 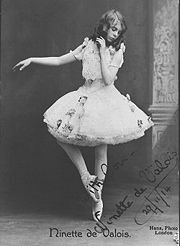 Markova also appeared in Casse-Noisette (The Nutcracker) and Le Lac des Cygnes (Swan Lake) in the same year. Her partner for the latter was the young Robert Helpmann. The early roster of company stars was completed by the teen-aged Peggy Hookham, Margot Fonteyn and Michael Somes. The company spent the war years touring widely in Great Britain and, to a lesser extent, in Europe, performing for the Allied troops. Immediately afterwards, in February 1946, they transferred to the Royal Opera House, premiering a new full-length production of The Sleeping Beauty to reopen Covent Garden as a lyric theater after its war-time closure. In 1949, the Company performed in New York for the first time with Fonteyn and Helpmann dancing the leading roles in The Sleeping Beauty. The couple had created an international sensation, which was to seal the future Royal Ballet's reputation worldwide. The following morning, the international status of both Fonteyn and the company were confirmed by the American press, starting a pattern of overseas success. De Valois continued to direct the company through the 1940s and 1950s, but the greatness of the enterprise was sustained with works by choreographers Sir Frederick Ashton and Kenneth McMillan. Throughout the years at Sadler's Wells Theatre, and the early years at Covent Garden, the creative team, was completed by the company's musical director Constant Lambert. Ashton's choreographic style was the first to shape the mature company, remaining a major influence throughout its history. Renowned for a precise and unforced lyricism, he could create, with equal ease, the light-heartedness and grandeur of Cinderella (1948), the soft but overwhelming emotion of A Month in the Country (1976), and elegantly abstract pure dance in works such as Symphonic Variations (1946). MacMillan was to be distinguished for his powerful, intensely dramatic works, pushing dancers beyond traditional conventions for technical and emotional framework of ballet. His first three-act work, Romeo and Juliet (1965) remains a signature work of the company. In the years before his death, he created prolifically for the company with works including The Prince of the Pagodas (1989), Winter Dreams (1991) and The Judas Tree (1992). In 1956, to mark its 25th Anniversary, the name "The Royal Ballet" was granted by Royal Charter, and in the following year Princess Margaret became president of the company. Seven years later, Ashton succeeded de Valois as director, but even with the added directorial responsibility he never stopped creating his own ballets, such as Monotones (1966) and Enigma Variations (1968). In 1962 de Valois invited Rudolf Nureyev to join the company as a guest. He was to form the great partnership with Margot Fonteyn. This—the final partnership for Fonteyn—blazed a trail across the world through the 1960s and 1970s. Another celebrated partnership was also taking shape between Antoinette Sibley and Anthony Dowell, and many individual talents were maturing, including those of Merle Park and Lynn Seymour. In 1970, Kenneth Macmillan unexpectedly replaced Ashton as director. Both Ashton and MacMillan continued to create for the company, with Ashton producing the last of his works in August 1980: Rhapsody. It was a masterly conclusion to 50 years of a long series of pure dance works. MacMillan also broadened the repertory, bringing in choreographers from overseas including Glen Tetley, Hans van Manen and Rudi van Dantzig. He also acquired works by George Balanchine, Jerome Robbins, and John Cranko. He relinquished the directorship of the Company in 1977 to concentrate on his choreography, and Norman Morrice, formerly of Ballet Rambert, was appointed to succeed him, with a brief tenure to develop the younger dancers in the company's own ranks. Anthony Dowell, the company's former leading male dancer, succeeded Morrice as director in 1986. Throughout his directorship, he built on his inherited base, and capitalized on the new talent which had emerged and developed under his eye, notably Darcey Bussell, Alina Cojocaru, Viviana Durante, Sarah Wildor, and a plethora of male talent including Stuart Cassidy, Adam Cooper, Jonathan Cope, and Bruce Sansom. Dowell produced new versions of the two most famous classical ballets in the repertory for the company: Swan Lake (1987) and The Sleeping Beauty (1994). Both remain faithful to the original Petipa choreography as it was handed down to de Valois' young company and, through the years, to the current generation of dancers, while seeking to renew them for a modern audience through set and costume designs. MacMillan created works for the company up until his death in 1992. The company's education department runs an enormous range of projects, varying from single preparatory workshops for students attending special low-priced schools' performances to six-month projects involving professional dancers and children and culminating in performances at local theaters. There are also longer-scale projects including the "Chance to Dance" scheme, initiated in 1991, which offers early ballet training to talented children from a variety of ethnic backgrounds to assist the long-term development in England of a pool of professional-level dancers reflecting the ethnic mix of the country. The first young graduates of this scheme are now entering full-time ballet training. The Royal Ballet continues its tradition of overseas touring. Under Dowell's directorship, the company visited Australia, the Far East, Russia, Europe and the USA. A triumphant return to New York in 1991, after an eight-year absence, set an American seal of approval on Dowell's first five years as director, just as in 1949. Dowell was created Knight Bachelor for services to ballet in the 1995 Queen's Birthday Honors List. He was director of The Royal Ballet until August 2001 when he retired, having brought the company up from West London to reside at the Royal Opera House for the first time. Dame Ninette de Valois maintained a close interest with The Royal Ballet and in particular the Royal Ballet School until her death on March 8, 2001, at the age of 102. In August 2001, Ross Stretton, previously director of Australian Ballet, succeeded Sir Anthony Dowell as director of The Royal Ballet for a period of 12 months. In December 2002, Monica Mason, the ballet's former assistant director was unanimously elected to succeed him. Prince Charles became president of The Royal Ballet in Spring 2003. Lady Sarah Chatto has served as vice president since 2004, carrying on her mother, Princess Margaret's, involvement with the company. May 2006 was the 75th anniversary of the Vic-Wells Ballet's first performances at the newly reopened Sadler's Wells Theatre. The Royal Ballet has marked this occasion with a recreation of that very first full-length ballet The Sleeping Beauty. In December 2006, following the award-winning success of Chroma, Wayne McGregor was appointed The Royal Ballet's resident choreographer. In April 2007, conductor Barry Wordsworth was re-appointed music director for the company. A very diverse company with dancers from all over the world, today the principal dancers include: Tamara Rojo (Spain), Miyako Yoshida (Japan), Viacheslav Samodurov (Russia), Federico Bonelli (Italy), Carlos Acosta (Cuba), Leanne Benjamin (Australia), Zenaida Yanowsky (France), Alina Cojocaru (Romania), Sarah Lamb (USA), and Marianela Nunez (Argentina). Swan Lake has been in the Royal Ballet's repertory since 1932. The favorite of The Royal ballet has been Coppelia. A version of it was first produced in 1933 by the fledgling Vic Wells company. Ninette de Valois, who had an acute sense of the value of tradition, employed Nicolai Sergueyev, the former regisseur of the Mariinsky Ballet, to reconstruct Acts I and II of Coppelia. The first night was March 21, 1933. The company first performed the full three act ballet in 1940. It was in this production that Robert Helpmann starred as Coppelius, a richly comic interpretation that critics hailed as unforgettable. In 1954 the company was provided with new scenery and costumes by Osbert Lancaster. In 2002, the 1954 Ninette de Valois production was re-staged as part of 2001-2002 season which was dedicated to her. History of "Royal Ballet, London"
This page was last modified on 20 July 2015, at 21:09.